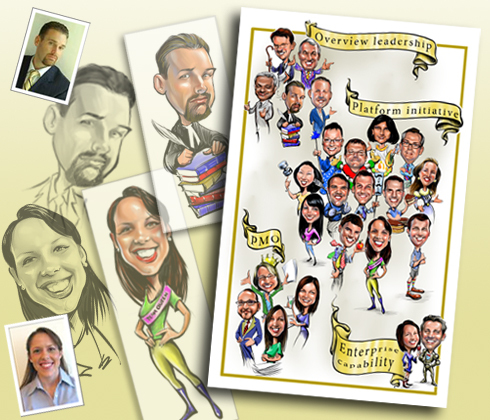 Group caricatures are a great way to portray the team in a fun and friendly style. We can create a caricature of everyone at your office. This can be placed on your website or signage. A group of friends, family, neighbors or project team. family or office group caricatures make perfect Christmas cards. A unique gift for retiring people at your work. A Group Caricatures can be done with your desired theme and style. We can incorporate any background and detail that you feel is appropriate. Ask for specific detail or a particular background color. Our group caricatures are priced differently depending on people or items required, size, etc. Group caricatures ordered are completed on archive quality, acid free cotton base boards. A digital copy of the group caricature can be produced in your desired format. This file is cleaned up, color corrected and ready for print. We can also create the digital copy only if you want to print the artwork.